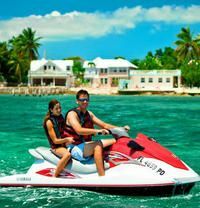 The ultimate jet ski tour of Key West takes you around this little island with a guide who knows the waters perfectly. They have ridden through these places many times over, and they show you how much easier it is to ride these things as opposed to the other watercraft that you might have tried. There are jet skis for your kids, and there are jet skis that fit adults. You all are given a life jacket, and the tour guide keeps you altogether. The simplicity of this tour is that you could stay in one location for a while just to joy ride, and you might see to it that you are all playing with things like dolphins that are swimming among you. The jet skis that you use are some of the finest in the world, and they are completely safe for you and your kids. The tour guide is someone who can keep you safe, and they will keep your kids on the jet skis even if this is their first time. The experience that you have on Key West is beyond any other vacation you could have, and alters your perspective on vacationing. The people that want to take a jet ski tour must get their tickets online for less, plan to ge out for most of the day, and bring the kids. There is room for everyone, and the tour allows your family to truly enjoy Key West. Go on the shore after for a drink, and you might repeat this experience the next time you come out to Key West. Please note: Pricing is per jet ski. When checking out, 1 Adult equals 1 Jetski, and is based on double occupancy. Each Jet Ski can accommodate up to three riders—not to exceed 460lbs (208KG). Pricing is per jet ski. When checking out, 1 Adult equals 1 Jetski, and is based on double occupancy. The driver must be 18 years or older with a photo ID, but passengers can be any age (if under 18 years, a parent must sign for them). You cannot participate if you're pregnant or under the influence of drugs or alcohol. Adults born before January 1, 1988 must bring a valid ID to operate the jet ski. Those 16 years of age and born after January 1, 1988 must also bring ID and be prepared to pass a Temporary Safe Boating Test for a fee of USD $3 in order to operate the jet ski. Those 16 & 17 must also be accompanied by an adult (18+) to operate the jet ski. If you are required to take the test, please advise in the Special Requirements field when making your booking. Security Deposit of USD $300 cash or credit card required for each Jet Ski. If you wish to have a single jet ski, individual bookings must be made. Experience Key Wests tropical blue waterways on this 90-minute Jet Ski tour along the Atlantic Ocean and/or the Gulf of Mexico.